I’ve never really got into Valentine’s Day. It isn’t because I don’t believe in it or care about it but rather because my partner and I celebrate our anniversary of getting together two days later (16th February 2010 – talk about feeling increasingly old!). So on that Saturday we made a bit of an effort, I mean I did my hair, makeup AND EVEN put a dress on, and headed out for brunch. We went for a short walk along South End, Croydon before reaching The Joker. I had spotted it a couple of weeks earlier, looked it up online and decided I wanted to head there for myself. As well as having a bar with a range of interesting twists on classic drinks they are home to Humble Kitchen; situated in The Joker and also at a location in Brighton. The choice of items, such as the marble table and aged armchairs worked well for the general look of the place. We tried to figure out what used to be on the site before and I remember saying that it gave me the vibes of an old Sainsbury’s on Lower Addiscombe Road where they had recently rediscovered the original tiles hiding away. After coming away and doing some research I was able to be pretty smug, though also concerned that I was able to identify the design after seeing one other example of it, because sure enough it was the site of one of the first ever Sainsbury’s! What we do know is that the original tiles were on the floor and walls, though clearly at one point hidden, and a sympathetic reveal/rescue has been carried out. This is a rare case of somewhere that has a hip nature actually using original features instead of spending more money to give it that rustic feel. All I wish is that there was a photo or artistic piece that showed what the building looked like through the eras to be able to appreciate the tiles in their original setting but that’s a pretty small niche desire of mine to understand the history of buildings. As we were treating ourselves that day I decided to go all out and have whiskey on the rocks which came with a lovely infused spray. It would usually come with some orange but apparently they were all out, which we only discovered when it reached the table instead of when it was getting ordered. I would have happily stayed with the drink choice that I had made but wish that it was one that I could have changed if I wanted to based on that information. That was probably the biggest issue that I had during our visit there. The drink itself was good though and came in at a very average £9. What screams brunch more than eggs benedict? Okay perhaps avocado and smoked salmon on toast but there’s only so many ways I can handle being a twenty-something cliche on one given day. The Humble Kitchen had two different options of eggs benedict, one mushroom and one braised beef cheek, and we both ended up ordering them. The mushroom one, that I opted for, was delicious. The burnt butter hollandaise sauce was smooth an gentle whilst also being full of gentle flavour that complimented the perfectly cooked runny poached eggs. The fresh chive across the dish added a subtle added level of depth without impacting on the dish in any real noticeable way whilst the mushrooms were well cooked, not at all greasy thanks to them being done confit, and had the woody nutty taste to really help bring the dish together. Even with chatting with eating and there being a large amount of sauce on the plate, especially once the poached eggs were opened, the muffin bases stayed warm and with structural integrity instead of becoming a soggy mess like they sometimes can; it showed that they were gently toasted from fresh and placed onto a warm plate rather than toasted from frozen or placed onto a cold plate and that’s the small detail I hugely appreciate. My partner pulled a happy face and made some ‘this is tasty’ noises when eating the braised beef cheek and you can only assume he enjoyed it because he didn’t offer me any! The mushroom version came in at £10 whilst the braised beef cheek would set you back £11. Given the quality of the food and that it involved eggs made to order I can handle the delay in the food coming out but it did take about thirty minutes from ordering to the food landing on our table which seemed like quite a long time to wait (the kitchen was in high demand as well though!). There are also a couple of vegan options on their menu meaning that you can go with any of your friends, between 10am-2pm on a Saturday or 10am-12:30pm on a Sunday, for a catch up over cocktails and brunch. If you miss brunch times, thanks to a heavy session the night before, they also serve a different menu throughout the rest of the day that sounds equally divine and worth the wait. The lack of information about them lacking a bit for the drink and the food taking a while to come to the table would usually be a deal breaker for me. However, the food was good quality, the staff were friendly and attentive and the atmosphere was pleasant. I wouldn’t run there for an average brunch trip out but I would happily go along for drinks and catch up with a friend or family. Some people were also sitting down working on a collaborative project at a laptop and it certainly gave that friendly chilled vibe for that to be possible. As well as the food and drink The Joker also hosts an art club and various other social get togethers making it a fantastic mini community hub that gives it a real secure place in the heart of South End. We’ve moved out of our Addiscombe flat and into a new part of town. Places we have looked at before and thought “that might be nice to visit” are suddenly right on our doorstep to walk to, try out and (hopefully) admire. We’re without internet so the following post, pictures and all, come from my phone so if the quality isn’t perfect then I can only apologise for not doing this place the justice it deserves. The first on our list, a week after moving in, was to go and get brunch in a cafe somewhere. After the man left that was installing a new window and changing the locks we popped our shoes and coats on and started a walk to an unknown spot. We decided to stop in Crystal Rocks Cafe. A clean, presentable and well loved looking spot situated in Croydon’s South End. The finishing touches to the place, from the choice of wood for the furniture to the rope with light bulbs on, really gave it a comforting and enjoyable vibe. It had well considered and carefully placed photo frames on the wall and the bar for payment presented a delightful looking array of sweet treats. The welcome we received was warm and friendly by a couple of stylish workers and they provided an additional menu to allow us both to look with ease. It’s great to cone across a cafe that only has a single menu on the table instead of adding clutter with a number of them wedged between items. Service was swift and continued to be done in a way that gave a good aura. There was no rushing going on and it felt like they were welcoming you into the establishment to truly enjoy. Both staff members seemed to work seamlessly as a team which always helps to bring that comfort to those visiting. The drink, a strawberry fruit smoothie, was refreshing and a good balance of flavours. It coming in a mason jar wasn’t necessarily the biggest of surprises but it worked well with the aesthetic and didn’t do the drink any harm. It did mean it came with a plastic straw though, which given the whole straw debate of 2018, and this is something that they could perhaps look into. Crystal Rocks is a halal cafe, something that doesn’t bother us after buying from a halal butcher on the daily in our North London days, but that obviously means the bacon isn’t pork and a few other things might be turkey or beef instead. The bacon on my American pancakes with egg and a side of syrup was cooked to perfection, not at all greasy and cut through the other flavours on the plate well. In fact the whole dish was just delicious, full of flavour as well as being light and airy. My partner went for the Turkish Breakfast. We’ve gone to a few cafes that serve these and every place seems to have its own take on it and this was no exception. It looked absolutely incredible and, unsurprisingly, I loved the plate it was served on. The egg was well cooked with a great runny yolk, the bread tasted fresh and full of flavour, there was a great variety of foods with decent separation to stop all the tastes merging together and they weren’t stingy with the portion size. If my own wasn’t so delicious I would have been jealous! Two drinks and two dishes came to just under £19 which isn’t the cheapest, when there is a Wetherspoons over the road, but for a scrummy brunch in a friendly atmosphere with a wonderful sense of design around you it is totally worthwhile. Very pleased to have this as my nearest cafe and will be returning again in the future. Goodbye 2018. Goodbye clutter. Out with the old and in with the new yadda yadda. Literally. The flat is filled with boxes. It’s time to face a new adventure and move into a bigger place. And with that I need to say goodbye to my small collection of empties that were sitting gathering dust. I’ve not really done a huge amount of makeup in the last few months though there are aims in 2019 to get back on the tackling my brows and whacking on some mascara bandwagon. Even doing my nails has sort of fallen by the wayside. A lot of baths have happened though. We are talking to the point where for a while I had to use some shower gel as bubble bath (my stock of which is now replenished)! It’s pretty much all I’ve had the energy for after a day at work and especially in the last couple of weeks where my weekends have involved packing aches and pains too. I do have some product aims for 2019 and hope to share that soon inside a post that talks about my general aims for the year. A new home almost certainly means no internet for a while but that also means less distractions so I can get the posts written, the photos taken and use a close eye to check it all looks okay via my phone app before publishing via a desktop at work in my lunch break (cheeky!). My product empties seem to show one thing; if it stops me being stinky and helps make my bath that little bit nicer then I’m interested but anything else is fairly mreh. I went to use the mascara and after having it on for the day realised that the drying out I spotted on application in the morning was a bit of a sign that it was beyond its best. It’s a similar story for some of the nail varnish where the texture changed either as a result of so much being gone from the bottle or it just not getting used for a number of years. The eyebrow pencil by Model Co, that I got in the 2017 Look Fantastic advent calendar, was something that I used up to the very end. This pencil had a smooth application and the universal shade actually worked for me because of the light brunette shade of my brows. It was easy to apply lightly or with a fairly hefty amount but it never ended up allowing for me to go overboard which is a real lifesaver! It was a lot better than some of the really cheap high street brand ones that I have received and it is something I would consider buying again if I wanted that type of brow product (currently feeling liquid ink style ones a bit more though). Finishing another perfume in 2018 was something I’m calling a small miracle as at points this Hugo Boss For Her scent just seemed to hit a bit of a standstill and no matter how much I used it there felt like the product amount stayed the same. That’s not a bad thing with this perfume as the scent was one that I enjoyed and it managed to linger on the skin for a good couple of hours which is more than a lot of my mid-price range perfumes can manage. It was a fairly gentle fruity scent rather than teenage girl fruity and it made it really wearable for everyday at work and kept me feeling sophisticated (ha). Ow and Wilko Fruits bath soak is still my favourite and I made the most of an order of towels and other bathroom bits to get a few bottles of them delivered to me recently. The Mermazing one by Imperial Leather wasn’t too bad but not wholly my jam. Finally, I want to chat about the I Love Juicy shampoo by Lush. It worked well, had a lovely aroma that lingered in the hair afterwards and felt nourishing but for the price it didn’t win over The Body Shop banana products which are very frequently half price to allow for purchasing of both the shampoo and the conditioner for the same price as one of these bottles. If The Body Shop were to disappear then I would give this or other Lush shampoos a try however. Figuring out what we want can be really tough sometimes. We become torn between our immediate wants and our long term desires. Should we rent a nicer flat or save those couple of hundred pounds to crawl towards a deposit of a place to properly call our own? Should we get that replica dress or wait an extra couple of weeks for that little bit more luxurious thing? Are ten weekend breaks better than one epic blowout cruise? Does oven cooked pizza really satisfy the tummy as much as takeaway pizza? And after we stop and think about all of those questions is there really a correct answer or a way that we should be doing things? In fact does anybody other than ourselves really care about whether we take a year or ten to save for something that we want? Probably not. For so long money was at the front of everything I did. We either didn’t have it or we did and I was so worried about being in a bad place again that I would attempt to save and refuse to treat myself to things because it still seemed frivolous. And there were the other times when I knew that there was money and I would just buy things that didn’t necessarily make me happy but I bought them simply because I could. I’ve bought a lot of sh*t over the years but I don’t regret a single moment of it; each item has brought me to where I am now in terms of understanding what I want and how saving can work for me. Finances are extremely personal not just to each household but even down to each individual and whilst this can cause clashes there are usually ways of working everything into a sensible compromise. But with a new job it all feels a bit of a new year, new me or like I’ve just gone back to university and have great ideas as to how I can save money to get from one payment to the next. Sort of. Apart from the fact that there’s actually enough money in the piggy bank to get from one day to the next without worrying or having to cut back. In fact our total household income will be at the highest it has even reached so saving without restricting our wants will be more than possible and that really really gets me excited. my post-tax wage will be the same as my previous pre-tax wage and I was managing to, in theory though often squandering it away just as quickly, save a couple of hundred pounds a month in my previous job. God I might even be able to have avocado on toast and still save towards getting a mortgage before I retire. A millennial miracle. Establishing what it was I actually wanted to save for was the first important step and something I haven’t really done in the past. Usually it is just an attempt to save without a goal and that’s probably one of the key things that makes it fall off the bandwagon so quickly. One of the things is to be able to move into a bigger flat, maybe even rent a house, so I calculated the amount for a deposit, moving van, new bits of furniture we might want and so on and put down realistic dates for achieving those targets; Things like new bits of furniture coming later in date because we could move and make do with things like our current wardrobes for a bit longer. Realising the goal and that not every single thing needs to be ready for buying at once is a pretty huge step. Despite there being lots of things that I want to save for and purchase I took the time to differentiate between the big goals and the little goals. The bigger goals I have broken up, as I have just mentioned, but the smaller items are things that I would just like to be able to look at my bank balance and buy without guilt or feeling like I need to particularly ‘save’ towards them. Things like having a meal out or buying some new clothes or shoes are things that I want to budget for on a monthly basis rather than be saving towards (though if it was a very fancy restaurant or something like a £1000 bag then it might switch over). With this thinking I have five big goals with some of them coming in at still being saved for in four or five years time; moving to a larger rental property before starting to save towards a mortgage, learning to drive and getting a car, going on a big holiday like a cruise (weekend getaways should be possible under the budgeting for category), saving for the wedding and wanting to get a certain amount of pounds saved up before we have a baby. Despite putting time aims on the goals and the mini goals within them I wont be putting huge amounts of pressure on myself or beating myself up if things don’t go quite to plan. Managing to save some money is better than nothing. Because of being the only person in the world to love spreadsheets it will be no surprise for you to learn that I’ve put my aims and tracker system onto a spreadsheet. It’s super simple and easy to update with a few columns for my goal, what I’ve saved so far towards it and how much something actually came to; I’ve budgeted an amount for new wardrobes that is over any of the wardrobes I’ve seen and like but would rather go too high than too low. For example: I’ve gone £500 for the wardrobe but most of them are coming in around the £350 mark. I want to track all these things so that then I can put the remaining £150 I’ve saved somewhere else but be able to see where that money has actually come from. It sounds incredibly basic but personally if I can see the way that money has shifted from one place to another I feel it holds me more to account as I’m less likely to be all “wahey I saved £150 on this wardrobe so now I can buy a litre of melted chocolate” or something equally bizarre. If I make a saving somewhere or something comes in over budget I still want to be able to acknowledge the amount I have saved and that there are other places the money can go to as well. In 2019 I’m thinking about doing something that I’ve seen a few people do on Youtube but am not sure if I will be able to stick to it so to find out I am going to do a test run at the end of 2018 once my first new job wage comes in. Every time they finish a beauty product or a book they look at the value of the product or the amount that they know they spent on it and put that amount towards their savings fund. Some people use this fund to replenish foundation when they completely run out or to buy new books that they see getting released and I think I might do something similar. It wont be exactly the same though as I am going to tally up that amount of money and write a list of the things that I might like, but don’t see and want to grab off the shelves immediately, and come the end of 2019 decide whether I really want those items and get them from this list. I’m thinking a new piece of jewellery or a type of shoe I already have several of or an eyeshadow palette that I don’t really need but everybody manages to rave about. It’s a good way to reward myself for my book no buy and my attempts to use up products (like this one here). There is also the part of me that would love to see me making some additional money from this blog or from my social media accounts but given it hasn’t happened in the last eight years of blogging, though I have received PR in that time, it seems like an unlikely thing. If this was to happen though the money would go back into the blog with an improved layout, new artwork and getting new products to try out but all these financial dreams and blog ideas haven’t even made it onto the spreadsheet yet as I feel getting my life sorted out with the five big things will naturally help me to create better content. But I aren’t really too fussed about this either way, it’s just a bit of a pipeline dream… maybe by 2020. And of course to make it less of a distraction I’m putting the money into a separate bank account, away from my regular account, so that I can’t physically see the money without going and scrolling through apps for it. Out of sight out of mind right? Is this what reaching 24 is like? You start to think of yourself as mid-twenties and go into a quarter-life crisis about your future? Yes? I thought as much. If you want to see what sort of things I buy then be sure to check out my twitter and instagram stories! How do you manage your finances and saving goals? I’d love to find out in the comments below. Back at the end of summer, or the start of autumn depending on your perspective, I discussed how Eat Up! was helping me to think about food in a different way. How it made me want to savour each bit of food, take in all the aromas whilst cooking and to not feel guilt around wanting something traditionally deemed ‘bad’ by the food industry. As you might realise it all sounds a lot easier said than done so I thought I’d share a bit of an update as to how I’m actually getting along with it and sharing other things that I have figured out along the way. Before we begin I just want to put a reminder out there that ‘healthy’ eating is simply about being happy with the food you eat, listening to what your body wants and needs and finding ways to cook and eat that you enjoy so you’re getting the really good for you nutrients into your system. It isn’t about eating greens three meals a day or denying yourself anything. This is about listening to your brain and body and coming up with a way of thinking that provides happiness with food and doesn’t give any room to shame or guilt. This is one of those cases where you can have your cake and eat it. The first time I found myself craving pizza, I immediately found myself feeling shame. This was several weeks into trying to not feel such thoughts and until then it had been going pretty well. I guess no real challenges had come along until then. And for the first day of desiring pizza I let the feelings of guilt and disgust win out but on the second day, a cold but sunny Sunday afternoon, I ventured out to Sainsbury’s solo and picked up a four cheese pizza without a care in the world. As I stood at the freezer section, with a mum and her two girls next to me debating over ice cream, I didn’t feel any shame about reaching in there and making it obvious that “yes, this is my dinner”. In that moment the only guilt I felt was not following my cravings sooner. Of course that wasn’t the only time that I felt the shame of a craving creeping in but this occasion of getting the pizza served as a reminder to consider why I want the item and that if it will bring some sort of comforting happiness maybe I should just go with it. There were also the moments when I was just in a bit of a mental slump and cooking hit the back-burner. It reached that point of me just not wanting to go anywhere near the kitchen let along look at an ingredient or whip a meal together. When moments like this happen I used to just sort of come to accept it even though it doesn’t make my food part of my brain or my tummy sing with joy. But with my new attempts of trying to enjoy everything I managed to at least appreciate the delights of the tinned soup that I was heating up or the cube of cheese that I munched on as a snack. It might not sound delicious to you but they are the simple foods that make me happy and feel a sense of comfort. In doing so I found myself able to creep out of the food slump a little bit quicker than normal and I did it by building up slowly. On the day I bought that four cheese pizza I also bought some avocado to just get a bit of the nutrition into my diet that my body was starting to cry out for and from there I felt excited to add other things into my food routine. Again there was guilt that tried to sneak in though and at times it felt like I couldn’t win. I wasn’t trying to force myself to eat certain foods and that itself made me feel guilty and then when I did start to eat them I felt guilty for not starting again sooner. But overall I managed to tell myself to not have regret over anything and to instead appreciate the simple moments of joy I got from the foods that I did eat which really takes a lot of brain training to do. There have certainly been times when I have thought it to be completely impossible and like I might need to seek out some serious professional help to shake these feelings but that idea only led me to feel horrible about myself. I’m very clearly not at that stage just yet and need to continue to move in the right direction myself first before being able to talk one to one in a small plain room about it all to some random person pretending not to judge me with all their mmm mmmm’s. Attempting to essentially retrain my brain over the last month or so has proved to be really extremely difficult and takes a huge amount of willpower and self-desire. This is something that I have needed to do for a long time but only recently found the internal strength to attempt and it very much feels like a better late than never sort of moment (though really it isn’t late at all it’s just the right time for me) and there is still a huge way to go. I’m not sure I’ll ever really be able to eat food without guilt or having some sort of shameful thoughts occasionally pinging around my head but being able to make some sort of progress on it and acknowledging when those feelings exist is still a start. Have you ever tried to retrain your brain around how you think about food? If so what helped you or what was the biggest hurdle? Cafetieres are beautiful to look at, therapeutic to put into action and produce great flavoured coffee but sometimes we just don’t have the time to get involved with one; the time it takes to prepare, to empty and clean up afterwards can take away some of the joy especially if you’re rushing around in the middle of the day or in a cramped makeshift kitchen in the office. Or we have dreams of one of those fancy coffee machines that equally take a lot of time to clean up but at least elevate the kitchen to another level but for most people finding worktop room for such an item is something that will remain a dream for many years to come. Unless it’s a day off I can think of so many other ways to spend my time than scooping wet coffee from a cafetiere or coffee machine into a food waste box for composting (a cafetiere cuppa on a Sunday morning is a real treat). Then there are those amongst us that want a good brew but don’t want to take a diversion to the nearest coffee shop, to carry around a travel mug or to hand over several of our hard earned pounds a day. Everywhere we look there are people rushing around trying to find a perfect cup of coffee to get their day going because the freeze-dried office granules have gone all lumpy from somebody with poor wet spoon etiquette. Without a fancy coffee machine that is well maintained, somebody that has the job to just use the cafetiere all day or free coffee from a local cafe on tap then there was little choice to hand over those pounds for that much needed caffeine boost or simply go without. 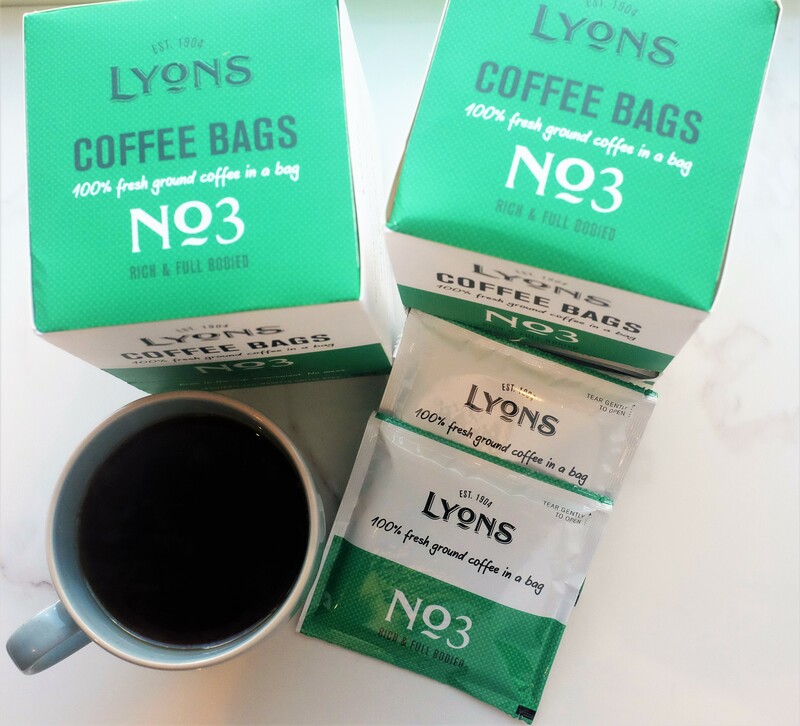 Lyons coffee have finally provided us with a much needed solution that allows us to make a cuppa as quickly as we could with the freeze-dried stuff, with as little mess as the frozen stuff but with all the flavour and freshness as a freshly ground brew. At last you can get freshly ground coffee in an oversized teabag, dunk it for a couple of minutes, add your extra syrups or milk and sugar and be on your way without any of the mess or having to step out into the cold rain to search down a coffee. And not only do they provide a convenient and no mess solution they also allow you to get that freshly ground coffee aroma and whack of flavour without draining your bank balance as a box of 18 bags comes in at £2.60 (that’s basically the cost of your Monday drink alone). It’s an absolutely fantastic concept and I’m pleased to see them at a range of supermarkets including Sainsbury’s and Waitrose as well as Amazon (to bulk buy) as it allows for quick purchasing as part of the weekly shop or with a few quick clicks if you have a few other items that you need to purchase as well (but I always recommend buying direct from the company when possible). I’m currently loving the No3 blend which is rich and full bodied, providing a smoothness of texture and gentle flavour that builds in the mouth over time. There’s absolutely no bitterness to it either so I don’t find myself needing to lean towards the milk or sugar to balance it out. It’s perfect just as it is. They also do a couple of other blends that are gentler on the flavour and pack more of a punch to ensure that whatever your coffee preferences are, whether they stay the same all day or you start strong and then go milder, there is something available for you. In fact, this coffee is pretty much the reason that I drink coffee at all right now as nothing else has quite managed to live up to it. These are really delightful little bags of joy that have enhanced my love of coffee. Are you a lover of coffee? Do you tend to add milk or sugar to yours? I’d love to find out in the comments below. *Whilst these products were sent to me to try out and with the hope of my sharing my thoughts all views and words are completely my own.